Whether you're a Philippe's fan or Cole's believer, the real question is—do you dip? 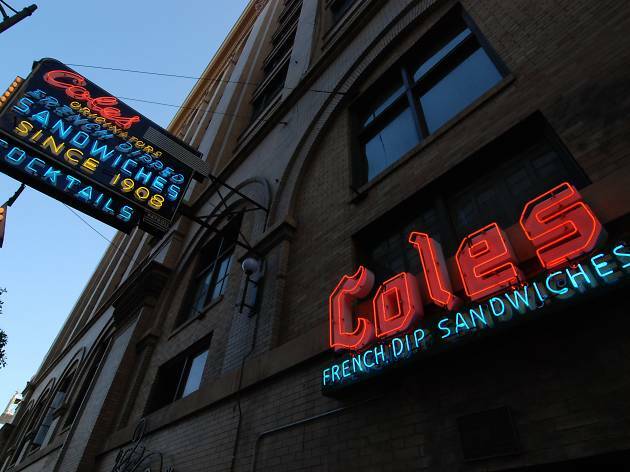 Originators of the French Dip (or at least they claim to be), Cole's sits in the same Downtown location since 1908 when it opened its doors as the city's first public house inside the Pacific Electric railway station. Today, the booze is still flowing—pick your poison amid a selection of classic cocktails and brews on draft—and diners can order up hearty, beef jus-dipped French Dip sandwiches. There are also happy hour (Tue 11am-close; Mon, Wed, Thu, Fri 3-7pm) specials at recession prices like $5 well drinks and $5 1/2 dip sandwich plus fries. Yummy French dips in a classic location that speaks to old LA charm. If you're looking for a cheaper French dip, in a cheaper "old LA" location--sure, Philippe's is a good option. But if it's a tastier, higher quality sandwich and a higher quality vibe you're looking for, Cole's is your spot (even if technically, Philippe's may have invented the sandwich first). Whether you go with one of their classic offerings or something different, everything is delicious. The price point can feel a little steep, but Cole's is an experience. A great place for a meal or cocktail with friends or a new beau, and if you're really looking to impress someone, stop by their in-house speakeasy, The Varnish, afterwards. Fun historic spot to grab a french dip sandwich and cocktail/local craft beer. Get the spicy garlic fries and put mustard on everything - it is spicy and delicious. Cole's is an easy walking distance to the metro. 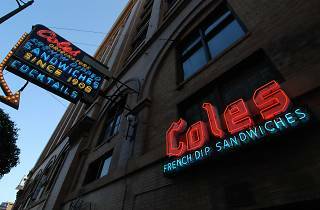 If you love french dips, you absolutely have to come and grab one at Cole's. The area of town it is in is a bit off-putting and sketch, but once you step inside you'll feel like you went back in time. The sandwiches are exactly as you'd expect, filling and well-crafted by a place that has been doing it since before most of us were born. Grab a sandwich, grab fries, and grab one of their super strong drinks - get the full experience! Once you're done with your meal, if you feel like drinking some more and staying in the time machine, head to The Varnish (the secret cocktail bar hidden inside). A French Dip and a whiskey sour, a classic combo. Though I mostly recommend coming here for the speakeasy in the back, they don't allow food back there, so order a French Dip at the bar--I love that a half order is an option. The speakeasy itself is (no surprise) small and dark, but surrounded by booths perfect for a small group of friends or romantic date night. An old-school experience with a very high cool factor. Welp, Cole's is definitely an experience. On my last visit, I sat at the bar and ordered an Old Fashioned and a bowl of chili. The chili was great, the Old Fashioned was legitimately the strongest I've ever had (hey, happy hour) and the bartender called me "sweetheart" no less than seven times. If you're by yourself, it's a fantastic place to go to nurse a cocktail and eavesdrop on everyone around you while taking in the old school ambience. This place just oozes old school cool. It's right on the edge of a sort of sketchy area of Downtown, but this particular street and restaurant feels straight out of the early 1900s. I love the French dip here, especially with a side of spicy garlic fries. The fries aren't too spicy, but be aware that the atomic mustard most definitely is. The drinks are great here, too (there's a speakeasy bar in the back of the restaurant). And make sure to come by during happy hour to grab a real cheap Old Fashioned and feel like you're Don Draper.